I've had these symptoms before... starter solenoid on the inner passenger fender. This is a NEW solenoid too... what gives? I haven't even been able to drive this much except for just around after I tinker with something to see if it made a change. Are they so prone to going out is the reason they put them there? Is there a heavy duty model? This is frustrating along with so many other things that I can't seem to get right on this. Since nothing else is working, it is NOT your solenoid. 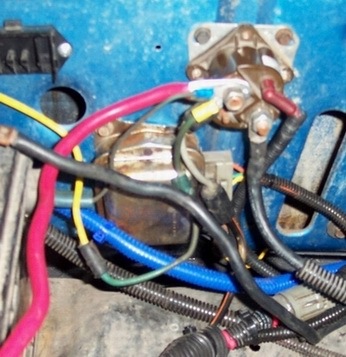 On the battery side of the solenoid there should be some other wires connected to the terminal, (all connections to the truck are done on the battery side of the solenoid except the starter). Those wires have fuseable links. You probably have a bad link. The first one I would suspect is the one connected to a heavy yellow wire. Ford uses a heavy yellow wire as the main feed line to your fuse panel. Since you have so many problems, I still recommend you get a new harness. A new harness sounds great... but I would probably screw it up..
Now, what happens when I jumper it...before I do it. I'll check out the fusible link, what do I do to test it or fix it? You should have a cable from the battery to one side of the start solenoid (large terminal). The other large terminal should go to the starter only. A lead with a plug (red with blue stripe), goes a small terminal. All other connections go to the large terminal that the battery + cable hooks to. If you jumper 12V to the small terminal, that is the same as putting the key in the start position. If the key is not in the ignition all that will happen is the starter will turn the engine over, (truck in park). 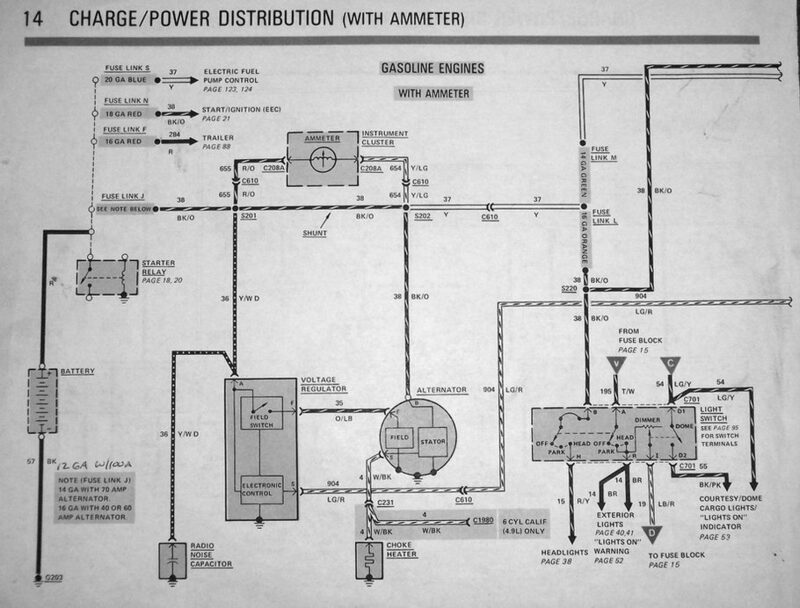 These diagrams are for an 83 but close enough for government work You won't have a lead going to a fuel pump. By chance what kind of shape are your battery termials in? Have you cleaned them? The key to an efficient electrical system is clean tight connections. All the terminals are clean on the battery and solenoid, as they are both just a little over a month old. Ok. I took a piece of wire and put it between the battery + and the small terminal on the solenoid. Nothing... no click.. nothing. Thought I might have misread the post, so I lightly tapped the battery - and the small terminal.. the solenoid clicked. Thats it. Educate me on a 'fusible link'. What is it, how do I test it, etc. All the things that I see just look like rubber boots on wires.. Battery isn't dead.. I tried to charge it and it keeps saying FUL on my digital charger. So what do I do if a link is bad? For a temporary fix you can cut it out and just use a wire connector to reconnect it. Matt did you get the EVTM for your truck? If so it will tell you where to find the fusable links, and the colors of the wires. Just like fuses, different colors denote different amperages. The fusable links in my '90 bronco are in the wiring harness between the battery and the passenger fender. Grounds are also very important. I think there is one for the headlights near the driver's side headlight to the left of the radiator support. Matt V, the fuseable link wire in your pic has a square section close to the end. It acts like a fuse to protect your wiring and will burn through or break if there is a short or overload. Judging solely by the pic you posted, it looks OK. What happens when you jump a wire across the two large terminals on the solenoid? Just a click, or nothing/ that means either the battery is low (which you said is fine) or the starte is the problem. it could be bad, stuck and not turning, or you have a poor connection from the solenoid to the starter. 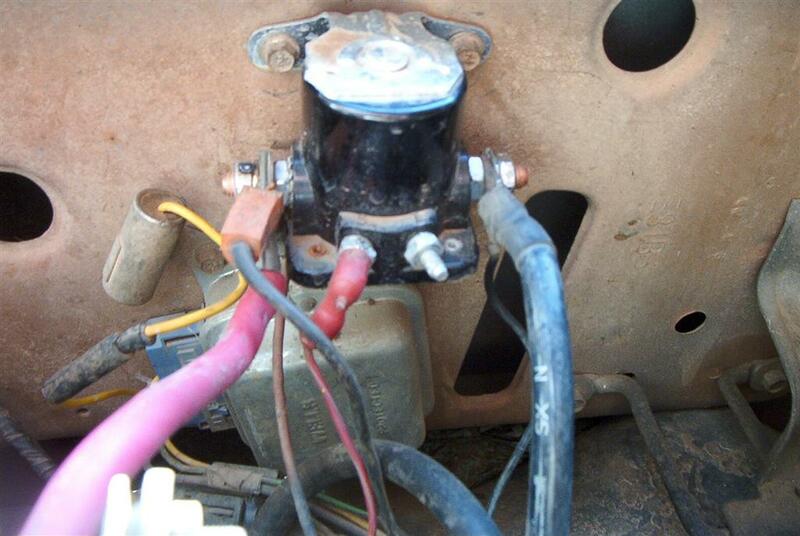 The starter solenoid is a relay that gives power to the starter for only a short time. It's activated by your key switch thru the small side terminal whne you turn the key to "start". If you hold the key too long when the starter just spins and the motor won't start, the solenoid will quickly get very hot, even start to smoke. I would go thru 2 or 3 in a year before re-doing the ground system on the 84 Bronco. AS already mentioned, it's important to have clean terminals and ground connections. And while the cables or wiring may look OK, they can get rusted or corroded from the inside. For now, let's see if your starter is bad or not. We had a discussion in the chat with him last night. Gave him a procedure to go through using a volt meter and to forget all problems except this one. He really needs to take a methodical approach rather than a, "try this try that", shotgunning approach. There are multiple issues with his truck and he needs to trouble shoot one at a time. Based on the fact that lights don't work as well, I'm guessing that it is in the ground side and that he doesn't have a good battery to engine block connection, (cable or connection to block). Once he can get the engine to turn over then move on to the other issues, one at a time. If he follows the procedure I gave him he should be able to figure out which component of this very simple circuit is bad. Yep, and I appreciate the help. I do get sidetracked easily so a methodical approach is good. On a related note, I had turned the emergency flashers on yesterday afternoon (before the chat) to see if when I wiggled a wire or something they would come on... forgot to turn them off, because they never came on. This morning when I got up and looked out the window.. there the Bronco sits... with the flashers just blinking away. Troubleshoot the starting, and like I said, it's probably a grounding problem, (cable or connection). Three main grounds involved in all this, (battery to engine block, frame and body, engine to fire wall). That funny stuff from the flashers is further confirmation to me you probably have a grounding problem. 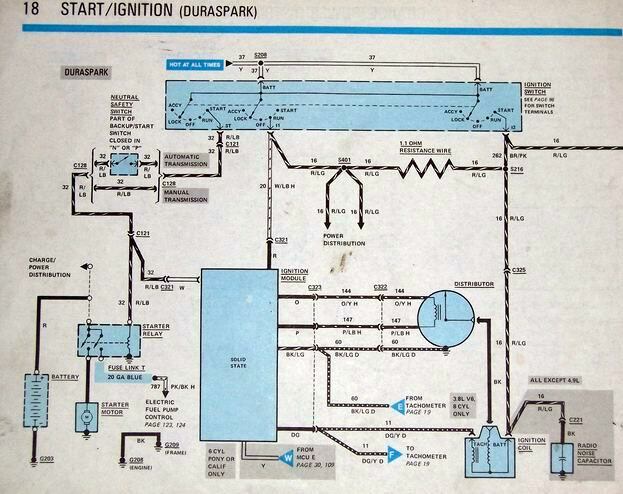 I wouldn't be surprised that when you find out why the starter won't turn over the engine that the other stuff will suddenly start to work. Oh, I bet all that stuff will start to work like you say. I just found it odd that they all of a sudden started to do something in the middle of the night like that. That's fantastic, Seabronc. Glad y'all got to chat and get a game plan. Y'all are right. It is a grounding problem... still haven't identified WHICH ground, but it is a ground. I found this out when I was tightening up the (-) on the battery and my ratchet hit the fender. I had the jumper wire 'attached' to the small terminal and the (+) post so I could get a reading.... well, when my ratchet hit, the engine started to turn over... of course it tried to weld my ratchet to the fender too... but at least I know it is a ground and nothing more serious right now. After I got through tightening up the (-) cable, and removed the jumper wire, I was able to start the truck.... go figure. Thanks for all your help so far!!! Interests:Camping, hanging out with friends and pretty much anything else out doors. I don't know yet if I love working on my bronco but I am pretty sure I will. Check the ground at you engine, mine was tight but when I had my engine rebuilt they repainted it and didn't grind it off before connecting my ground it made a big difference in the whole way my truck acted and ran. yeah, I will.. its pretty oily down there so I guess it could be interfering with the ground. I might do that this weekend, put it up on jack stands and try to clean all the gunk off as best as I can and redo all the connections.